Hear No Evil, See No Evil, Speak No Evil as The EU Leaders Refuse To Learn! Hear No Evil, See No Evil, Speak No Evil as The EU Leaders Refuse To Learn! As the EU’s 2 leaders hold talks as the huest of Matteo Renzi PM of Italy – They seem to stubbornly wish to carry on the EU scam asif nothing has happened and clearly Merkel & Hollande have learned nothing from BreXit, so we will no doubt watch Immigrants become an ever enlarging problem for the EU as Italy, Greece, Eire, Portugal & Spain slide further into unemployment and poverty and unrest spreads both wider and deeper within the EU – Forcing others to leave! Europe’s three most powerful leaders yesterday vowed the EU will not end after Brexit as they launched a desperate bid to bring the project back to life. 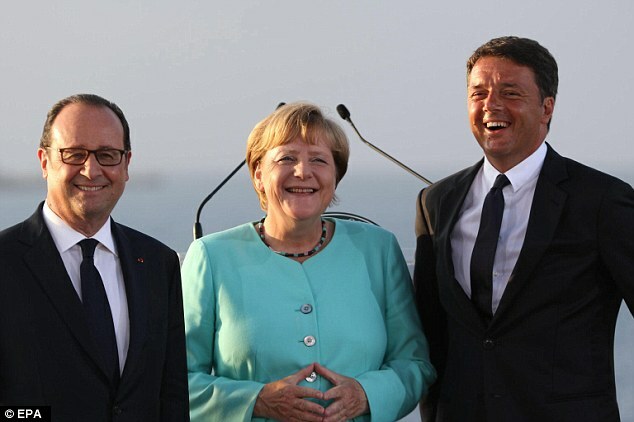 In a highly symbolic meeting on the Italian island seen as the birthplace of European federalism, the leaders of Germany, France and Italy attempted to show the EU was not dead. But they risked further inflaming Euroscepticism across the continent as they attempted to plough on without learning lessons from angry Brexit voters in Britain. The leaders of what will be the EU’s three biggest economies once Britain leaves aimed to present a united front as they met on Ventotene to discuss their gameplan for Brexit negotiations. The volcanic island off Naples is where the dream of a united Europe was born. In the 1940s dissidents Altiero Spinelli and Ernesto Rossi, imprisoned there by Mussolini’s regime, wrote a manifesto ‘for a free and united Europe’ on sheets of cigarette paper. It called for the ‘definitive abolition of the division of Europe into national, sovereign states’. It was smuggled out and later published. But instead of such lofty idealism, yesterday the leaders of Germany, France and Italy faced the grim reality of a growing backlash to their handling of the migration crisis and terrorism – and disagreements over how to proceed. The trio also risk hostility from the other remaining EU member states, with Eastern European countries making clear they will oppose any further integration. French president Francois Hollande yesterday admitted the EU faces the risk of ‘fragmentation and division’ but said it needs a ‘new impulse’ on three fronts – the economy, defence and security. Italian prime minister Matteo Renzi said: ‘Many thought the EU was finished after Brexit but that is not how it is. ‘We respect the choice of Britain’s citizens, but we want to write a page for the future. German Chancellor Angela Merkel recalled that the EU had been born from some of the ‘darkest moments’ of European history and stressed the need to deliver ‘growth to ensure people have jobs and hope in the future’. 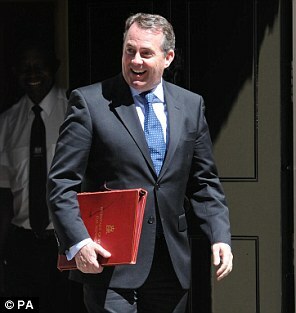 Liam Fox has boasted he is ‘taking over a wing’ of the Foreign Office from Cabinet rival Boris Johnson. The International Trade Secretary has been involved in a turf war with Mr Johnson over their role in Brexit negotiations, and was accused of a ‘land grab’ earlier this month after trying to seize part of his Foreign Office portfolio. Now he has boasted of the importance of his own post and claimed he has already taken part of the Foreign Secretary’s empire. Speaking to American radio host Hugh Hewitt, Dr Fox was asked about his new responsibilities and the task of creating a new department from scratch. 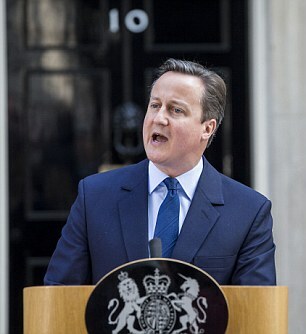 He replied: ‘We are taking over a wing of what is at the moment the Foreign Office. He also suggested he was taking portfolios from other senior ministers such as business and defence. Mr Hollande said he wanted greater co-operation on defence with plans for an EU army more likely to go ahead without British opposition. ‘Europe must ensure its own defence, and France is certainly playing its role,’ he said. 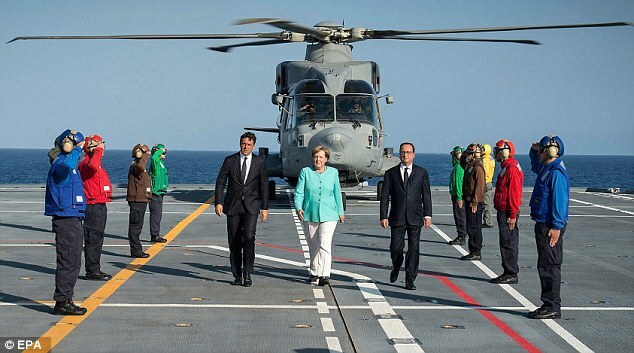 The three leaders spoke ahead of a working dinner aboard the Italian navy’s Guiseppe Garibaldi aircraft carrier, which was anchored off the island. The vessel is another symbolic location because it is co-ordinating the EU’s migrant rescue operation in the Mediterranean. Mr Renzi called the meeting in an effort to forge a common position on the way forward ahead of a summit of the 27 remaining EU states in Bratislava next month. The Brexit vote has raised fears of similar referendums in other countries, particularly the Netherlands, which opposes changes to the EU to achieve closer integr ation. Coming up with a road map acceptable to all will not be easy, with the Czech Republic, Hungary, Poland and Slovakia vowing to draw up their own plans for a less centralised EU. Mrs Merkel is holding a string of meetings with other EU leaders to discuss the post-Brexit EU, with visits to Estonia, the Czech Republic and Poland in the coming days and meetings with the leaders of Slovakia and Hungary in Warsaw. The German Chancellor has also invited leaders from the Nordic countries, the Netherlands, Austria and other eastern European nations for informal meetings at a government guest house in Germany. The three leaders did not elaborate publicly on how they planned to proceed with Brexit negotiations, but a French minister yesterday said they wanted the UK to get on with the process of leaving. Axelle Lemaire, a French finance minister said: ‘We want to know what Britain wants. It was good to have that clarification from Theresa May that “Brexit means Brexit”, but now we’re just wondering, what does Brexit mean actually? ‘It’s not about [other European countries] having a hard line or soft line [with Britain], it’s clear to everyone it’s not in anyone’s interest to slow down the process. David Cameron refused to discuss immigration during the Brexit campaign despite warnings it could cost him the referendum, a documentary reveals today. Former Labour Cabinet minister Lord Mandelson and Alan Johnson pleaded privately with the Prime Minister and George Osborne to address voters’ concerns on the issue, only to be rebuffed. Their intervention came a month before the June 23 vote, after figures showed net immigration had risen to a near-record level of 333,000. Mr Johnson said reaction to the figures should have led to ‘a really, really dramatic rethink’ of the Remain campaign’s strategy. But he said senior Tories were determined to stick to their Project Fear tactics on the economy and ‘not get pulled on to the ground of our opponents’. Will Straw, head of the Britain Stronger in Europe campaign, said strategists had been alarmed by the inability to counter Vote Leave’s message that leaving the EU would allow Britain to control immigration. ‘With about a month to go, I was very concerned about how we were losing the argument about immigration,’ he said. ‘I and Peter Mandelson suggested that the Government should address the perceived weaknesses about immigration. The Government figures were concerned that would detract from our core message, which was economic risk, and had decided not to pursue.’ The revelations come in a new documentary How We Voted Brexit, by journalist Anne McElvoy, to be aired on Radio Four tonight.